I’ve always been curious about the world. When I was a teenager, I backpacked around Thailand, staying in hostels as well as sleeping under the stars. And when, in February 1992, aged 28, I met my husband John, I was thrilled he shared my passion for travel. I returned to Thailand for our honeymoon in November 2002 – this time swapping dingy hotels for five-star luxury. Each year, we’d save up to go away. Holidays to Namibia and Morocco were so special – an escape from everyday life. And when, in September 2015, I decided to swap my recruitment job for running a beauty salon, I needed a holiday more than ever. With my diary full of appointments, I’d lie awake at night, compiling a never-ending to-do list in my head. I needed time to clear my head without any distractions – I realised for the first time, I wanted to go away alone. I went online and came across the website for Bliss Sanctuary for Women in Bali – a retreat for solo female travellers that offered everything from yoga and massages to sightseeing trips. It sounded perfect and within minutes, I’d booked a week-long stay. At £1,680, it wasn’t cheap but it included unlimited spa treatments, excursions and a chauffeur-driven car to and from the airport. When I told John, he immediately agreed I needed a break, even if it meant going without him. While he excitedly pored over the retreat’s brochures with me, my friends struggled to understand my decision. ‘Won’t you be bored on your own?’ one asked. ‘You won’t know anyone else,’ said another. But I told them I was looking forward to time to myself. Three weeks later, full of excitement, I boarded my flight. But when I arrived at the airport in Bangkok, with a five-hour wait until my connecting flight to Bali, I suddenly felt so alone and far from home. In that moment, I couldn’t help but question my decision to holiday solo and, holding back the tears, I called John. ‘Maybe this was a bad idea,’ I said. And when I finally made it to Bali – 23 hours after I left London – I realised he was right. Arriving at the retreat by chauffeur in an air-conditioned car, I could hardly believe the stunning villa next to a clear blue pool would be my home for the next week. While I enjoyed occasional meals with the other eight women staying on the retreat – including an actress and brain surgeon – this was my holiday and I spent the rest of the time alone. I had a one-to-one surfing lesson, went cycling in the paddy fields and whiled away hours reading by the pool. A week later, when I boarded the flight home, I felt relaxed and refreshed. John picked me up from the airport and he was so happy for me as I told him about the wonderful time I’d had. 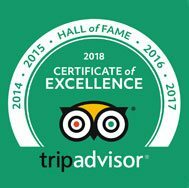 A month later, I started working in my beauty salon, The White House (whitehousekent.co.uk), in Kent, with a clear head, thanks to my trip away. And so far, my business has been a huge success. As for this year, John and I are planning a trip to Italy in May – our holidays together are still so special. 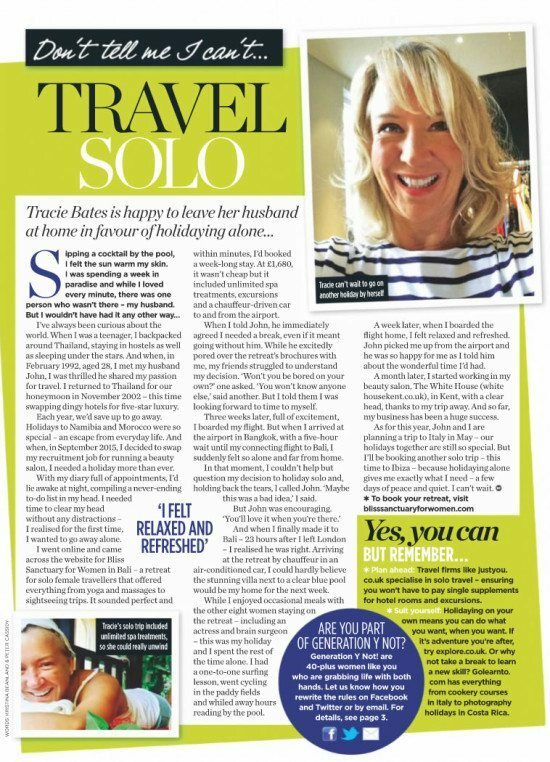 But I’ll be booking another solo trip – this time to Ibiza – because holidaying alone gives me exactly what I need – a few days of peace and quiet. I can’t wait.